“A teenage boy has told a jury that a Russian Orthodox priest forced him to drink alcohol before climbing on top of him in bed at his Sydney church flat. 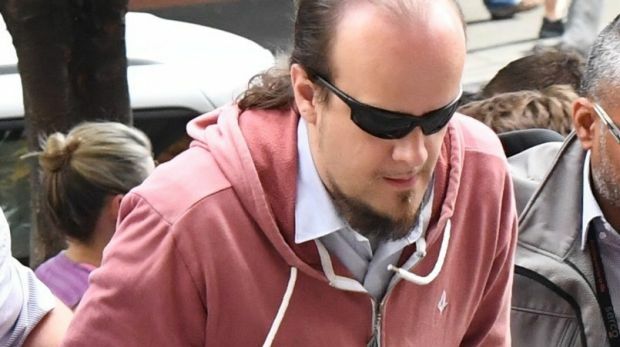 Stanislav Vakhabov, also known as Father Christopher, 35, has pleaded not guilty to detaining the then 14-year-old for his own sexual gratification, giving him intoxicating substances to make it easier to have unlawful sexual activity and four counts of indecent assault. Stanislav Vakhabov outside court on Thursday. The boy said in a recorded police interview played to the jury at the District Court on Thursday that Vakhabov also tried to take his shirt off, kissed him on the mouth and told him cuddling was a sign of friendship. Vakhabov invited a 14-year-old overseas boy to come to Australia before sexually molesting him and locking him in his Sydney church flat, a jury has been told. The boy’s deeply religious mother agreed he could holiday in Australia in 2014 because of Stanislav Vakhabov’s position in the church, the prosecutor told the District Court on Wednesday at the start of his trial. Vakhabov, known as Father Christopher, has pleaded not guilty to detaining the boy for his own sexual gratification, giving him intoxicating substances to make it easier to have unlawful sexual activity and four counts of indecent assault. In the crown opening address, the prosecutor said Vakhabov, 35, communicated with the boy via the teen’s Russian social media page. The boy told his very religious mother who “was very happy that a priest was taking an interest in her only son” and when she saw him on Skype she recognised having seen him on a Russian TV religious program. The priest asked the boy if he would like to visit him in Australia and the boy’s family took out a loan to buy him his ticket, the prosecutor said. When the boy arrived in Sydney in July 2014, Vakhabov took him to his single- bedroom flat on the Croydon church grounds. Church authorities, who had a child safety policy, had no idea the boy was staying alone with him. After finding out later that month they reported their concerns to police, the prosecutor said. On his first night, Vakhabov gave the boy beer and wine, watched the priest’s favourite movie Lord of the Rings and hugged him, referring to “brotherly love”, she said. “It is the crown case the accused gave him alcohol and tablets to help him have sexual contact,” the jury was told. “He would not allow him to go anywhere alone. When the boy asked why, he was allegedly told it was for his own safety and because there was only one set of keys. Speaking through a Russian interpreter in the interview, the teenager said he “never really cried before he came to Australia”, but towards the end of his trip he “was always crying and had a breakdown”. The sexual assault allegations involved him kissing the boy on the mouth during a South Park episode, climbing on top of him in the single bed and trying to remove his tracksuit pants, and rubbing liquid on him and touching his private parts. The prosecutor alleged that when police became involved, Vakhabov got the boy to memorise a story, telling him if he did not say those things he would not be allowed to go back home to his family.